Mindscape Innovations posted this notice in their recent newsletter: SB-12 (2017) Updates are up and ready for your input. Comments are due before March 11, 2016. Here’s the summary of the key changes, from MI’s newsletter. Big flag on the last one: Drainwater Heat Recovery Tradeoff has been removed. 15% Energy Efficiency Improvement: Each SB-12 package is designed to be 15% more energy efficient than current SB-12 packages, based on an ‘average’ home. Fewer Packages: To reduce redundancy of unused packages in the current version, the proposed number of prescriptive packages will be less, e.g. 6 instead of 13 for the scenario of Zone 1 – Natural Gas. Effective Thermal Resistance: Minimum thermal performance values for various assemblies are now listed in both nominal and effective. This will give a boost to buildings that use exterior continuous insulation, well the actual performance of the entire assembly, including thermal bridging through the studs, is recognized. Mandatory Heat Recovery Ventilators: Heat Recovery Ventilators is proposed to be mandatory across all packages, in order to facilitate better indoor air quality in airtight homes. Credit for Reduced Air Leakage: Recognition for demonstrating increased airtightess of the building envelope with a blower door test has been added. 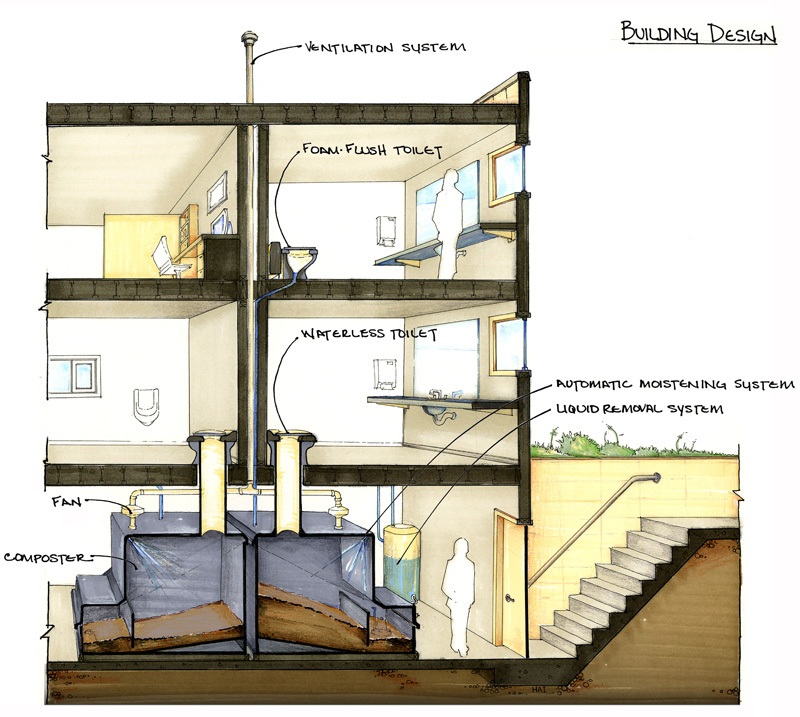 Improved airtightness can be used as a substitution for various insulation upgrades. Drain Water Heat Recovery (DWHR) Tradeoff has Been ‘Discreetly’ Removed: While MMAH doesn’t specifically indicate this in the list of proposed changes in their Backgrounder document, the proposed SB-12 (2017) update has been scrubbed of all traces of DWHR: where builders currently have the option of being credited for including DWHR by trading off another upgrade, they will no longer have this option under the drafted SB-12 (2017) update. Go to the Mindscape article for the full details and a solid argument for keeping DWHR in SB-12 (2017), and pass it along! There’s a lot to write about. 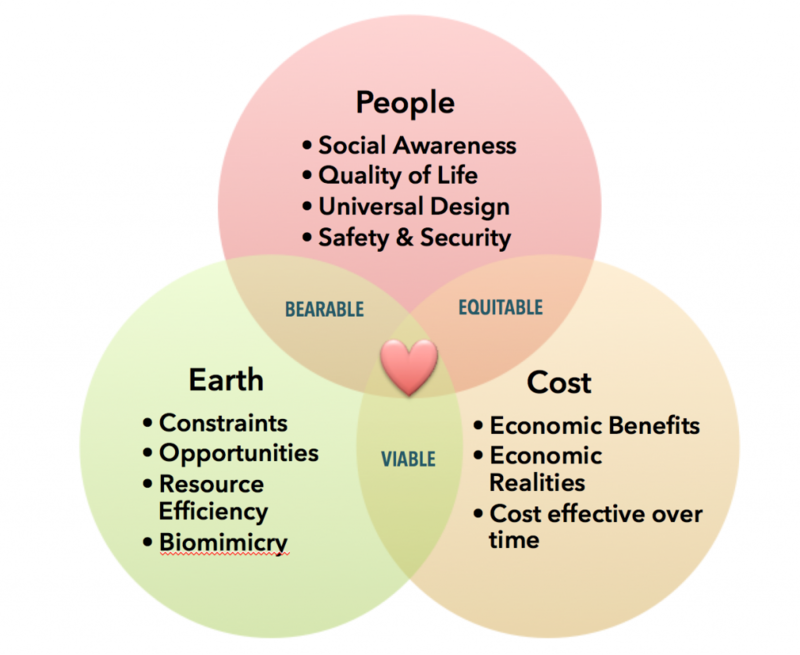 Over the years that I have been consulting with homeowners on how they can reduce energy and water use, make greener choices in materials and construction technology, ensure that their space planning is barrier free, user friendly and ready for aging-in-place, I’ve gathered a lot of experience and resources. 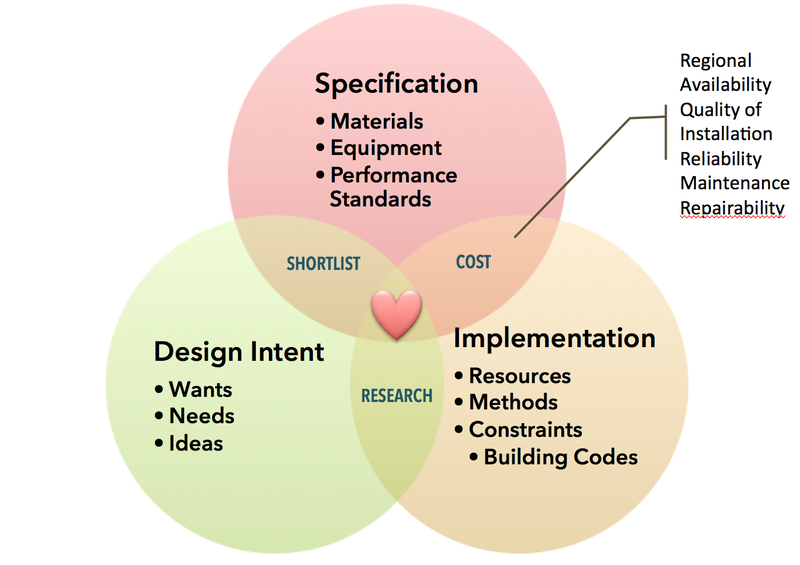 The design process is never a straight line from start to finish, and there’s a lot more to think about when you add sustainability into the mix. We constantly hear people say: I have my energy evaluation but what do I do now? Who should I get to do the work? What should I do first? Last? When it comes to energy efficiency, there’s a lot of information and noise out there to sift through. We can cut through all of that. We don’t sell any products, so we’re not biased one way or another. Except when it comes to homeowners. We are completely on your side and want to help you get and stay warm and comfortable, with lower energy bills. We can help you make decisions about upgrades and improvements quickly and effectively. We’ve found that we can be really helpful in a short and focussed house visit, and most people just need a little coaching to get going. So, we have a new Energy Coaching service in HRM and surrounding areas. While hard-surface flooring is on every list for improving indoor air quality, the type of hard-surface flooring may be problematic, especially if your clients’ health is already compromised. This article on formaldehyde levels in laminate flooring emphatically waves the health flag. The article is based on testing of Chinese-made laminate flooring. The testing was done by the Hardwood Plywood and Veneer Association. The article doesn’t make it sound very rigorous…“We went into a retail store and grabbed a sample, tested it and six out of eight flunked,” says Kip Howlett, President of the HPVA, an industry association that represents some Canadian and American flooring manufacturers. So let’s be fair, any processed wood product (be it laminate flooring, pre-finished flooring, a particle board vanity) that has been taken off the factory floor, shrink-wrapped and held in storage is going to offgas like crazy as soon as it’s unwrapped and exposed to the air. Even apples and apricots offgas naturally occuring formaldehyde. So let’s be very precise: urea formaldehyde (vs. phenol formaldehyde) is the problematic product here. Urea formaldehyde is an inexpensive glue used to bind wood products. I’ve heard/read/been told/taught that offgassing of VOCs and/or urea formaldehyde from processed wood products is worst at the exposed cut edges, not the formed portion of the processed board, and that the rate/extent of the offgassing is relative to the temperature of the product and ambient air. While the exposed edges on laminate flooring planks are a very small proportion of the overall product, and are not exposed to air movement when installed, laminate flooring has become very popular in houses with in-floor heating systems. Which could be a problem, except the exposed surface of the laminate is not the processed wood substrate or its cut edges. It’s the laminate — which could have a whole whack of other IAQ impacts, but I’m not going there right now. I haven’t yet found 3rd party monitoring that indicates the urea formaldehyde loads in a room with freshly installed/aged laminate flooring regardless of what country it hails from. It all leads to questions about the testing rigor, testing protocols, actual in-situ loading, and what levels a range of manufactured floor products from a variety of countries would test out out at…I’m gonna find me some more data points. Yes, yes, it’s me!! Pretty chuffed with myself. 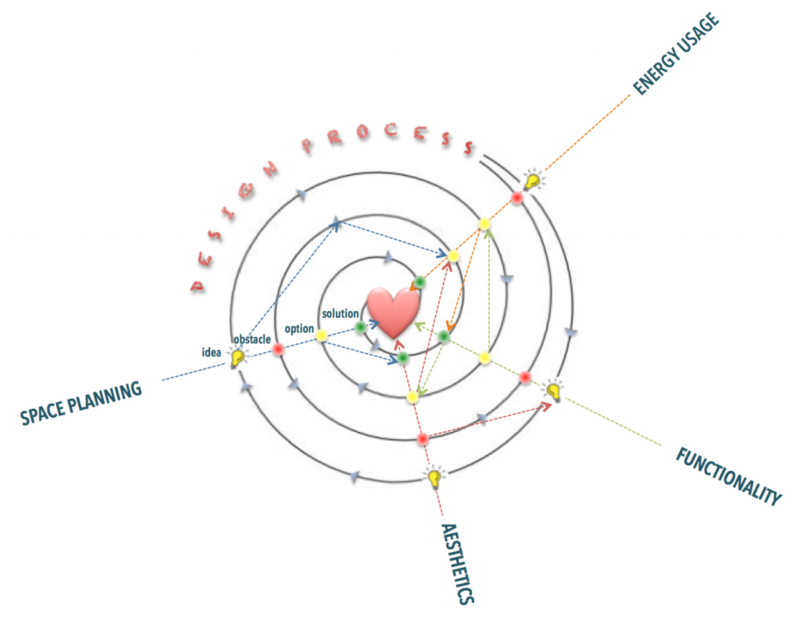 Send suggestions for articles, notes about cool projects you’re working on, Net Zero Energy/Deep Energy Retrofit initiatives in your area via this link. Nova Scotian Homeowners — interested in estimating your electricity usage? NS Power has a dandy little calculator that covers nearly all the bases. You’ll have to think a bit about your energy use, but that’s probably a good thing, right? How many hours a day do you typically have how many lights turned on? Do you leave computers and printers and other electronics on standby? How much of a phantom load are you paying for? And how are you going to determine what’s using the energy that you shouldn’t be paying for? Kill-A-Watt meter — lets you see how much energy any plug-in appliance, electronic device or thingy uses. Great for identifying your phantom loads. 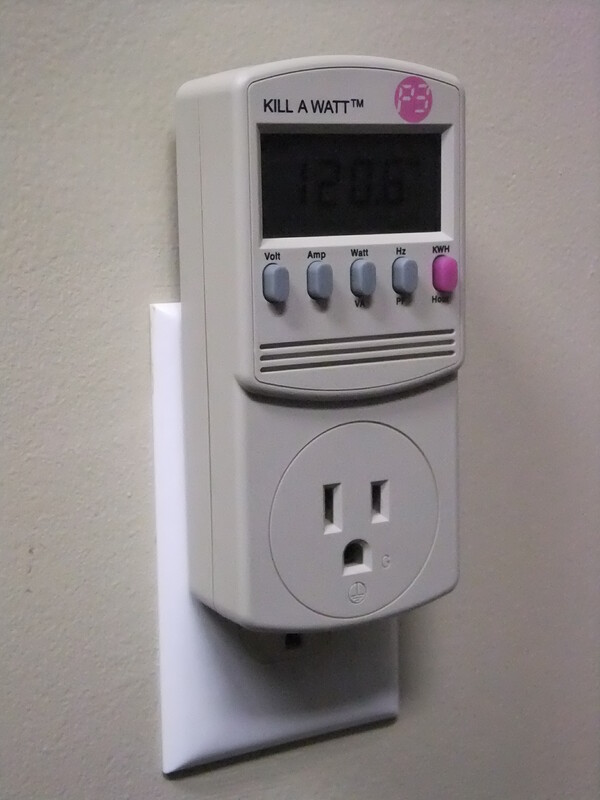 I have two Kill-a-Watt meters, they plug into the wall socket and then you plug your electrical device into them. The meters show what the draw is, and you can see how much electricity things like a fridge or a freezer use over a 24 hour period in kWh or $$ (or both). I’ve also used them throughout the house to determine what our always-on devices give us for phantom loads. But some things (water heaters and baseboards) for example, you can’t plug in. I’ve been very interested in monitoring systems for a long time, but haven’t been able to justify one for my household. I’ve signed up to be a beta tester for a monitoring system by Blueline Innovations (St Johns, NL) that uses a sensor on our meter to send energy use information to our wireless devices. We’ll see if we can reduce our energy usage through behavioural changes! Will report on our success or failure after the 90 day testing period. ‘Leathery’ spray foam has lost it’s air pockets and is no longer effective. Is it inert in this condition? A few months ago, I posed a question about spray foam installations and wet wood to some of the forums I belong to. Squishy, deflated, leathery 2lb foam. This was installed on the leaky concrete wall of a basement stairwell with a partial foundation, with a connection to an unflashed framed wall above. The house was built in 1836, while the stairwell was obviously a much later addition. The foundation is very wet, the tidelines on the mechanical equipment hitting the 8″ mark, and obvious water markings on the exposed part of the original rubble foundation. After reading all the comments from my original question about spray foam installations and the considered responses, I have to ask myself what spray foam contractor worth their salt would install in such conditions? The water damage is easily seen throughout the rubble basement walls. The insulation was sprayed onto the top 24 to 36″ of the rubble wall, but has lots of voids and cracks. There is also a wide range of spray consistencies visible — some of the foam looks positively cumulous, while other parts look like smooth lava. Rookie installer? D-I-Y install from a kit system? Who knows — the homeowners purchased this spring and have no records. From a cursory walk around the perimeter of the house, I knew there would be one fixable source of water leakage into the foundation: over the 175 years, the grade had settled (dramatically in some places), and snow melt and rain water were caught and funneled down into the rubble wall. Straightforward solution to that cause: regrade. Other problems with the foundation, not so straightforward, but we’ll see. 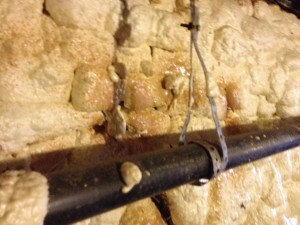 Water is getting through the spray foam…that’s a crappy installation with all those of voids. The state of this spray foam made me wonder about health issues, because it had so obviously perished and was dripping this ghastly caramel coloured ooze. There is some field research being done to look at the risks associated with installing spray foam (Field Research to Provide Deeper Look at Spray-Foam Risks – BuildingGreen), but I am not familiar with any studies published on long-term health risks to occupants as a result of crap installations like this one. There are substantiated issues with offgassing immediately after installation, yes, but let’s assume that the product performs as its data sheet indicates, and 24 hours sees most of the offgassing dissipate in a properly done installation. Water penetration in walls is a problem, period, regardless of the type of insulation that is used, so I’m not freaking out on one type of insulation. 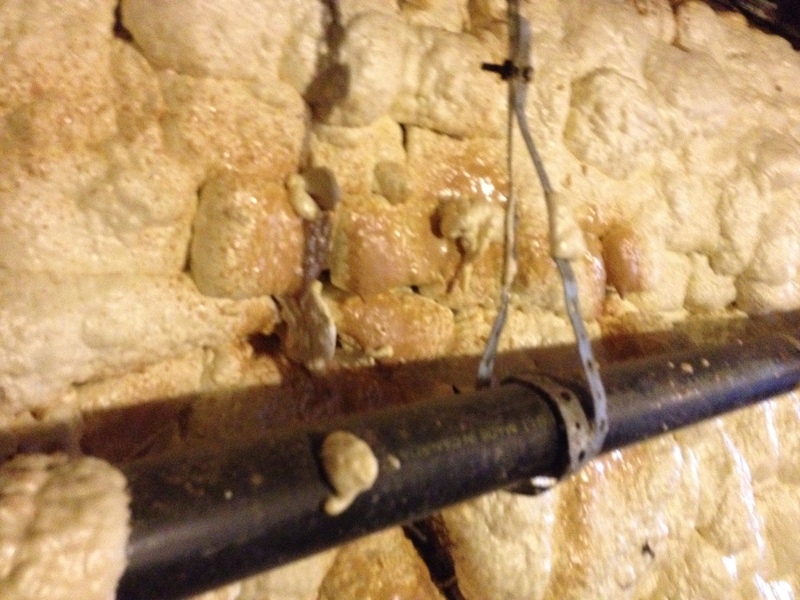 From many, many problematic basements, we know what is likely to happen in below-grade frame wall cavities filled with fiberglass batt insulation. 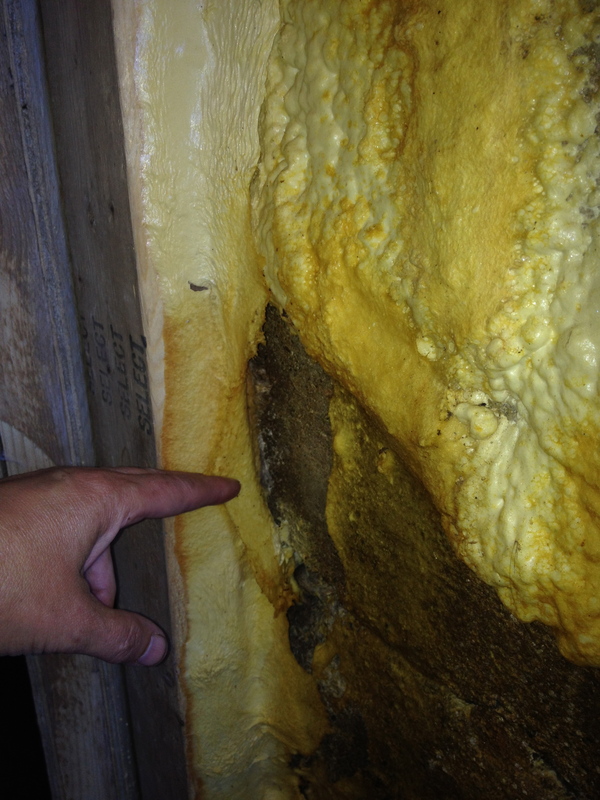 When the fiberglass gets wet, it doesn’t drain well or dry out and so causes mold growth given enough warmth. That causes health problems. Cellulose is a total no-go below grade for the same reason. As far as I’m concerned, rockwool is the best option for fibrous insulation below grade. Or spray foam. But only once the foundation is dry. There are so many indoor air quality and eventual structural problems that can be minimized or eliminated by eliminating water leakage into the foundation, and so many that can become exponentially worse by NOT eliminating water leakage into the foundation. Just got wind of The Archimedes ‘Liam’ turbine (oh, yeah, you knew I was going there). This thing is wicked cool looking. It’s loosely based on Archimedes screw principle, which is based on the nautilus shell, which is totally fractalian (damn, I wish I had made that word up) in my books. The Liam F1: 1.5 meters wide, 75 Kg of quiet, energy production for your urban installation. 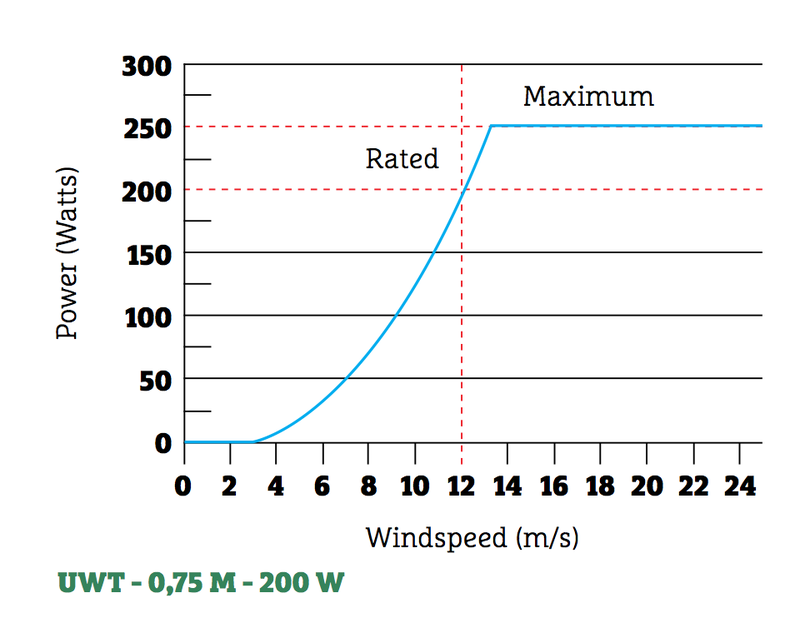 Most turbines operate below 60% (theoretical) maximum efficiency. The Liam operates (theoretically) 80%. This is the big 1500W version. The little one is 200W, .75m across, and 32 kg. I first saw this as a post on FB, and a friend wondered what the lifespan would have to be ’til the wee turbine paid for itself. So, being the wonk that I am, I did the napkin calculation. The article used the rated power production at 5m/s wind speed (25W) and calculated a miserable 1500kWh annual production. With a cost of $5450 US, that’s hard to justify: 1500kWh * $0.136/kWh (Nova Scotia Power) = $204/yr savings on electricity. Over 20 years, that’s $4,080 at today’s energy prices. As the average wind speed in Halifax is 15m/s, we can assume that annual production would be higher, but I don’t have algorhithm for the production curve on this beastie, so can’t say what that would be. But, given that NSP is going to continue to increase kWh price, and production would likely be higher, we can guestimate that the Liam would have to have a lifespan of 20 years to make back the price tag (big assumption: minimal maintenance). OK, so because I’m a complete wonk, I dove in further. There are 2 models. The one whose production is quoted in the article is the 200W unit, but the one that’s described (and shown in the picture) is the 1500W unit. The 5m/s wind speed is at the very bottom of the performance curve, just after the turbine cuts in at 2m/s (see performance curve for the 200W unit below). It’s rated at 12m/s and our average wind speed is 15m/s, but let’s say we get 10m/s average in a less than optimum installation. 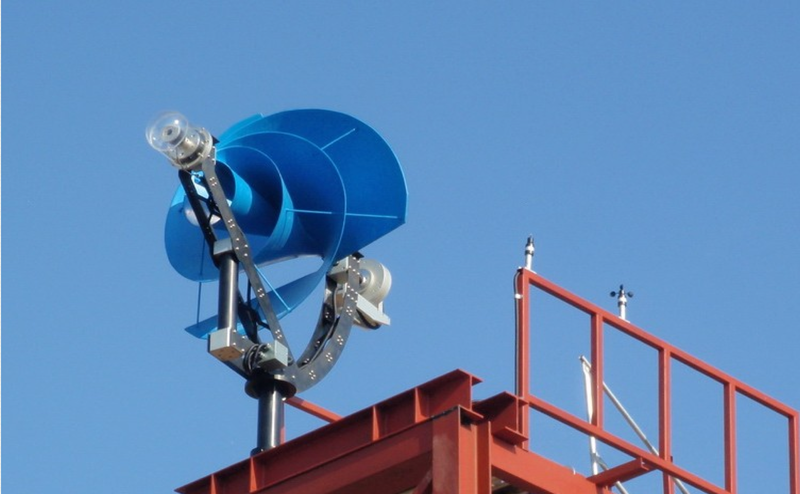 It’s rated to generate 125W at that wind speed (vs 25W at 5m/s). That is wildly better production…just over 7,500 kWh annual production. That’s an annual saving of $1,020 at today’s NSP rates. Now we’re talking. Even accounting for cut-out at +25m/s for 20% of the year, potential production is over 6,000 kWh ($816 in savings). And on top of that, the Archimedes comes in perfect whirligig colours. Very appealing.